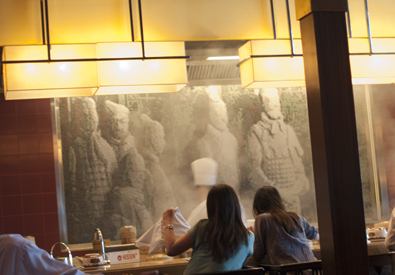 Steam billows from the open kitchen at the Hilton Kuala Lumpur's Chynna. After a couple days of hit or miss experiences eating in Kuala Lumpur, I still hadn’t found much luck finding some savory Malay fare. 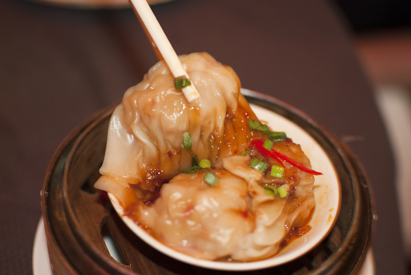 I scoured an online Frommer’s guide, with the help of my travel partner, and discovered rave reviews of a Dim Sum restaurant in the Hilton on the east side of town. A short metro ride to the hotel, and we reached Chynna on the fifth level of a mini food court inside the hotel. The hostess promptly greeted us and whispered that we were slightly underdressed in our shorts, as the restaurant requires a more business-casual look. She took pity on us (probably because we had that food mission stare) and ushered us to our table where we sheepishly stuck our bare knees under the long tablecloth and draped our napkins as sarongs. A look around and you were immediately transported into 1920s Shanghai with silk lanterns, crimson umbrellas, Oriental chairs and gold detailing. The open kitchen allows diners to see as a team of chefs toil behind pillars of steam. A wall of windows allows you to look out from your seat perched above a lush valley of trees. A tea master dressed in traditional Chinese garb popped up at our table to pour fruity tea out of a roughly three-foot long tea kettle spout. The end of the spout reduces to an opening about the size of a pea and the hot liquid shoots out – with applause-worthy accuracy I might add – like a pressure washing hose. Spicy Sichuan-style chicken and shrimp dumplings with chili oil. 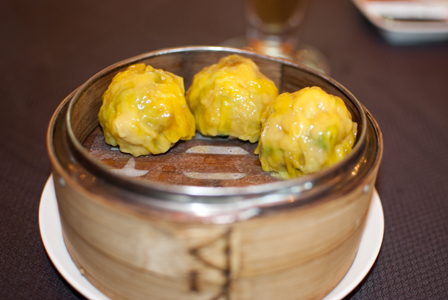 We quickly ordered up four kinds of steamed and crispy dumplings that landed on the table in hot bamboo boxes. (Side note: The bamboo hat-like boxes really add to the experience of dim sum. Makes you feel like you are eating tiny presents.) The spicy Sichuan-style chicken and shrimp dumplings were one of my favorites. The flavors were that classic salty soy with chilis and a crunch from the chopped scallions. The dumplings were heavy to lift out of their china dish with chopsticks but the combination of meats inside were so delicately steamed. No rubbery feel of overcooked shrimp here – a big no no if you as me. The steamed chicken and shrimp dumplings with fragrant scallions and vegetables were also light and fell apart when you tried to bite the golf-ball sized bundles in half. A quick dunk in the vinegar chili sauce is all these curry-colored dumplings needed. Steamed chicken and shrimp dumplings with scallions and spices. Steamed is delicious, but you just can’t look past the fried page without salivating. 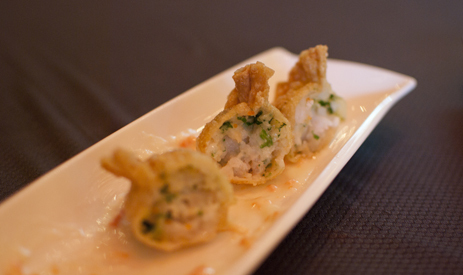 We ordered up some crispy shrimp dumplings to pair with our healthy treats – and they didn’t disappoint. These puffed, golden wonton bundles had a tender filling with a blend of herbs I couldn’t quite distinguish. The real complement to the dish was a shallow stream of lime-infused mayo you could drag each bite through – a great pop of citrus with the dumplings. Crispy shrimp dumplings with herbs. 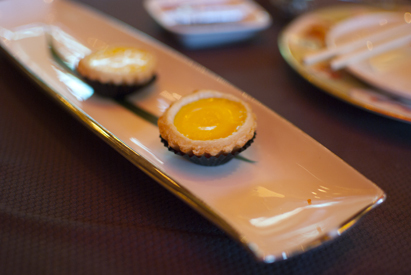 Take advantage of the lunchtime dim sum at Chynna to avoid some of the pricer dinner options. Most of the dumpling dishes, which came with three portions, totaled between 12 to 15 ringgit each (roughly $4-$5 USD). Some of the more upscale cod fish varieties increased up to 22 ringgit (about $7.50). Your bill really racks up though when you add in frosty Tiger beers (but why would you not?). This entry was posted in Uncategorized and tagged chynna, dim sum, dumplings, hilton, kuala lumpur, lunch spots, malaysia on July 7, 2011 by Claire Webb. Wonderful photos, and great writing! I’m a fan! Debbie P.